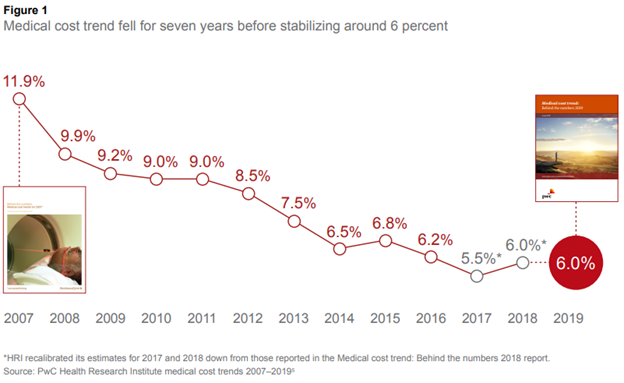 Employer health care costs are set to rise 6 percent next year, consistent with the trend over the last five years, according to new projection from PwC’s Health Research Institute. But while cost increases have plateaued at a level well below the rates seen a decade ago, they still outpace overall inflation — and PwC warns that the trend remains unsustainable. PwC also found that employers are rethinking their health plans for next year in hopes of insulating workers from rising costs. "When we asked 'what are you doing in terms of strategy'… last year, a lot of them were going to go full replacement, high-deductible plan. This year they really backed off" plans like that, PwC’s Barbara Gniewek told CNBC. That’s likely the result of a tight job market, she said. Employers have taken to offering plans with smaller provider networks or to contracting directly with health care providers. More employers are also offering advocacy services to help workers in high-deductible plans navigate the system. In the long run, health care has been claiming an increasingly large share of both employee compensation and gross domestic product. 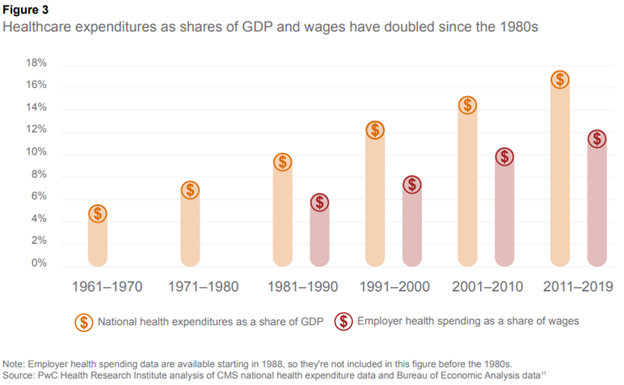 National spending on health is expected to grow from less than 6 percent of GDP in the 1960s to nearly 18 percent by 2020. And while health spending accounted for roughly 6 percent of employee compensation in 1988, that figure is expected to rise to more than 12 percent in 2018.